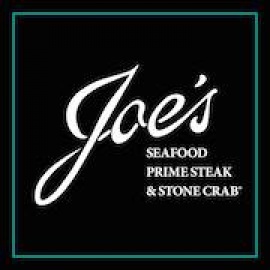 Joe's Seafood, Prime Steak & Stone Crab is famous for Florida Stone Crab Claws. They are hand-harvested and day boat caught from the Gulf of Mexico and processed at fisheries owned by our partners in Miami. They are sped to our restaurants, where they are cracked and served chilled with Joe's Mustard. They are best enjoyed with Joe's signature sides, like Cole Slaw, Grilled Tomatoes, Hashed Brown Potatoes and Creamed Spinach. Having gained a reputation as a world-class steakhouse, Joe's serves prime Midwestern grain-fed beef. Best known for the 16 oz, Bone-in Filet Mignon, Joe's also offers a dry-aged 24 oz. Bone-in Rib Eye, in addition to many other hand-carved steaks. Joe's features a wide selection of fresh seafood, sourced direct and served in season. Alaskan Halibut, Copper River Salmon and Nantucket Cape Scallops are among the most anticipated seasonal seafood offerings. A highlight of the dining experience is the tableside service with Dover Sole fileted to order and Jumbo Alaskan King Crab Legs, which are prepared tableside for guests to enjoy. Guests have come to love dishes like the Seafood Chopped Salad, Classic Cheeseburger and Fried Chicken. No visit to Joe's is complete without a slice of freshly baked pie. Offerings include Havana Dream Pie, Banana Cream Pie with Foster Sauce and Joe's world famous Key Lime Pie.